WHAT: USO Tour Led By Vice Chairman of the Joint Chiefs of Staff Admiral James A. Winnefeld, Jr. Note. For security reasons, the country names and tour dates cannot be released at this time. WHY: Admiral James A. Winnefeld Jr. will soon head out on his third and final USO tour as Vice Chairman of the Joint Chiefs of Staff, where he will once again bring the best of sports, music, television and film together to visit troops and their families. Designed to be a moment-filled trip complete with hi-energy shows and memorable base visits, the eight-day, seven-country USO Spring Troop Visit (which is coming early this year) will feature Indianapolis Colts head coach Chuck Pagano, quarterback Andrew Luck and tight end Dwayne Allen; Pittsburgh Steelers guard David DeCastro; “American Idol” alumni Diana DeGarmo and Ace Young; American film, stage and television actor Dennis Haysbert; Miss America 2015 Kira Kazantsev; platinum recording artist and season 11 “American Idol” winner Phillip Phillips; as well as motion picture and television personality Jason “Wee Man” Acuna. Part of an ongoing USO tradition of partnering with senior leaders and working with celebrities to bring a touch of home to troops serving abroad, Admiral James A. Winnefeld Jr. has led two USO tours to seven different countries and created moments for more than 22,000 troops. Among the locations he has visited with the USO are Afghanistan, Germany, Italy, Qatar, Djibouti, Spain and the United Arab of Emirates as well as the aircraft carrier, USS John C. Stennis (CVN 74), at sea. This trip will mark the sixth USO tour for Haybert; fourth for DeGarmo, third for Winnefeld and Young; second for Acuna; and the first USO experience for Pagano, Luck, Allen, DeCastro, Kazantsev and Phillips. NOTE: The USO’s “Every Moment Counts” campaign invites Americans to join the Vice Chairman and his friends in honoring, saluting and creating moments that matter for our nation’s troops and their families. The campaign, much like this tour, centers around the countless every day moments – from family dinners and date nights to children’s births and bedtime stories – that our troops and their families selflessly sacrifice due to their commitment and service to our country. To learn more visit USOmoments.org. The USO lifts the spirits of America’s troops and their families millions of times each year at hundreds of places worldwide. We provide a touch of home through centers at airports and military bases in the U.S. and abroad, top quality entertainment and innovative programs and services. We also provide critical support to those who need us most, including forward-deployed troops, military families, wounded warriors, troops in transition and families of the fallen. The USO is a private, non-profit organization, not a government agency. Our programs and services are made possible by the American people, support of our corporate partners and the dedication of our volunteers and staff. In addition to individual donors and corporate sponsors, the USO is supported by President’s Circle Partners: American Airlines, AT&T, BNSF Railway, Clark Construction Group, LLC, The Coca-Cola Company, JCPenney, Jeep, Johnson& Johnson, Kroger, Northrop Grumman Corporation and TriWest Healthcare Alliance and Worldwide Strategic Partners: BAE Systems, BIC, The Boeing Company, ConAgra Foods, FedEx, GEICO, Harris Teeter, Lockheed Martin, Microsoft Corporation, Procter & Gamble, TKS Telepost Kabel-Service Kaiserslautern GmbH & Co. KG and Wawa Inc. We are also supported through the United Way and Combined Federal Campaign (CFC-11381). To join us in this important mission, and to learn more about the USO, please visit uso.org. What Does Dwayne Allen Recall About National Signing Day? Today, hundreds of high schoolers around the U.S. will sign their National Letters of Intent to various colleges. Below is a piece published on Colts.com last year where tight end Dwayne Allen recalls his memories of National Signing Day. The constant calls and text messages will cease on Wednesday afternoon for hundreds of high school football players across the nation. After months of being hounded by college coaches, wined and dined on various campuses, ink will be put to paper on where the next step of their football careers will take place. For the Colts Dwayne Allen, the memories of his own National Signing Day are vivid. As a promising prospect out of North Carolina, Allen was on the forefront of nearly every coach in the ACC and SEC when the 2008 signing period came to a close. Georgia seemed to be the favorite for Allen’s services and how could one blame him for choosing a school with a dozen conference titles and a pair of national titles to their name. But that glitz begun to wear off late in the process after a final visit to Clemson in late January, the chance to create history for another program was the ultimate selling point. “That was the vision that I had whenever I chose Clemson over Georgia out of high school,” Allen, who was ranked with the ‘best hands’ in the 2008 tight end class according to Rivals.com, said. Behind a Mackey Award (the nation’s top tight end) senior season, Allen helped deliver Clemson its first conference championship in 20 years. He had etched his name in the Tigers’ record books but Allen, always the team player, entered the NFL still wanting more. “I would trade all the accolades, the All-American, the John Mackey, all of it, to win a National Championship at Clemson,” Allen said. While that goal has come and gone, the next in line remains returning the Lombardi Trophy to the city of Indianapolis. Allen looked at his rookie season similar to what he experienced during his early years in Columbia, S.C., with the standard of success being the common denominator moving forward. “To come into this organization after the team went 2-14 last year and to turn it around like we did was unbelievable,” Allen said. While Dwayne Allen deals with the physical pain of not being able to play football, it’s the mental agony of watching his team each week that eats at the second-year tight end. “There’s really nothing I can do but I feel like I’m letting my teammates down in certain situations,” Allen said on “The Ride with JMV” last week. The usage of the tight end position in Pep Hamilton’s offense was intriguing to Allen all offseason. Allen was anxious to be employed in a variety of ways and he admits the offense he sees in the regular season doesn’t compare to that during OTAs and training camp. “This offense is a fraction of what it was in the spring and that’s just because of personnel,” Allen said. While Allen is away from the playing field, he’s seen almost daily at the Indiana Farm Bureau Football Center. Along with rehabbing and taking part in team meetings, Allen has also taken a position as a player executive with the non-profit Dream Alive Inc.
Former Colts offensive tackle Tarik Glenn spearheads the organization which helps service inner-city youth. When game time arises each week, Allen is filled with mixed emotions but he could not be happier in seeing the effort from a group that 6-3 despite missing five of their top offensive players. “That’s the way we were built,” Allen says of the “Next-man Up” culture. Over the past few weeks, the “Next (Men) Up” in the Colts backfield and offensive line have received the headlines. Yet, there’s Coby Fleener going about his business following Dwayne Allen being placed on injured reserve after Allen played in Week One. In the last three weeks, Fleener has 11 catches for 159 yards and two touchdowns. “I would say that I have to pick up some slack as far as some plays where Dwayne would have been in,” Fleener said on Monday. Fleener has seen his playing time increase over the last three weeks and that includes some significant blocks in the rushing department. On Sunday, Fleener had five catches for 77 yards and his 31-yard touchdown gave the Colts a 27-3 lead early in the third quarter. It was the fourth touchdown of Fleener’s young career and the second-year tight end could have walked into the end zone. “I think it’s kind of the idea in basketball, layups are some of the hardest buckets to make,” Fleener said of the wide-open touchdown. “It’s one of those things where you really have to focus and make sure you do all the things, look it all the way in and focus all the way until the end. During the offseason, Chuck Pagano said he expected Fleener to double the 2012 production of 26 catches for 281 yards and two touchdowns. Fleener is well ahead of that pace in yards and touchdowns already in 2013 and it’s his development in the run game that has also caught the head coach’s eye. “We’re asking (Fleener) to do a little bit more heavy lifting in the run game and he’s responding,” Pagano said on Monday. The sun is shining on the field at Lucas Oil Stadium, and there is no place like an NFL stadium on game days. Within moments of kickoff, it is an exciting time for many. Chuck Pagano’s return to Lucas Oil Stadium is on the minds of some. This will be his sixth game patrolling the sideline. It is a welcome sight. There have been past seasons when the preseason did not hold as much anticipation as this one does. The Colts hit preseason with the bar set high and with aspirations of earning another playoff berth. Still weeks away from league play, seeing a number of young players in action again is fun. Andrew Luck has worked doggedly in camp (who hasn’t? ), yet the second season for a starting QB is one fans are excited about. Coby Fleener has had a great camp. Ditto T.Y. Hilton. Hilton had a wondrous rookie season, and he and Fleener both are poised for exciting years. Dwayne Allen is out with a foot injury. He is confident of a quick return. LaVon Brazill needs good preseason work since he is out of the mix for the first four games. Josh Chapman is getting his first action after missing last year with a knee injury. Chapman has drawn praise from Pagano and teammates, with the coach calling him a “900-pound safe” in the middle of the line. 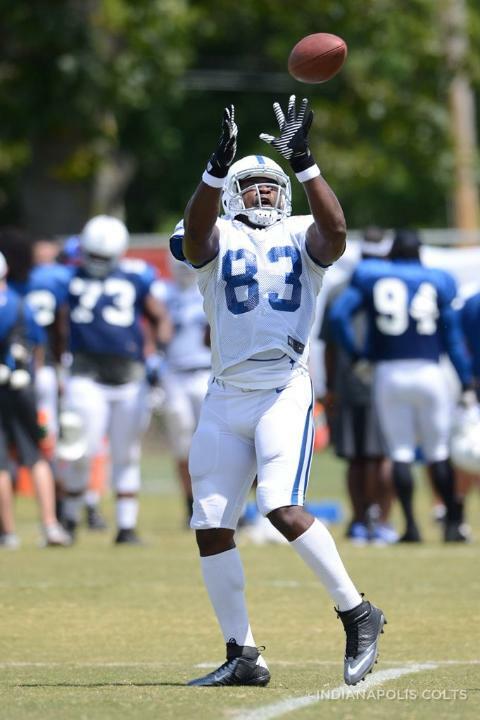 Vick Ballard hopes to build on a solid rookie year. More mature physically, the second year of a running back’s career is exciting just as it is for a QB, too. This will be the first game as a Colt for about 40 players on roster. Seeing a free agent class in action is in order for today. The Colts hope the influx of veterans will lead to more physical play. The ball will be in the air in less than 30 minutes. Mother Nature opened up her skies on Thursday afternoon but held off just enough for the Colts to get a two-hour practice done on the turf field at Macholtz Stadium. Thursday was the Colts final full padded practice before the preseason opener against the Buffalo Bills on Sunday. Butler not to be forgotten in the secondary: Darius Butler continued his strong camp on Thursday by making the same plays he made last season. Butler had a pair of pick six’s on Thursday (one each off Andrew Luck and Matt Hasselbeck). Butler’s knack for making big plays is something that can’t be overlooked in this defense. With a formidable starting secondary, Butler is the odds on starting nickel back which means he will see a ton of playing time against a Colts schedule that includes some of the game’s top passers. There’s a reason why Butler was chosen in the second round of the 2009 NFL Draft and he has taken full advantage of the Colts giving him another chance to live up to that billing. Power running gets some work in on Thursday: With the rain falling on Thursday afternoon it seemed fitting that the running game was a focus. The Colts first and second team offensive line both had successful days opening up holes for the running backs. Having the starting offensive line in tact for the entire first two weeks of training camp has been a key for the Colts rushing attack. Sunday will provide the chance for the Colts rush defense to go up against one of the league’s top backs in C.J. Spiller. Depth thin in the secondary: The injuries are starting to pile up on the defensive side of the ball, particularly at the back end. Safety Delano Howell and Antoine Bethea are the only healthy safeties with newly signed Ashante Williams going to have to a play a lot on Sunday. Other injury news included Darrius Heyward-Bey going through a few reps of 11-on-11 work on Thursday. Offensive lineman Joe Reitz returned to the practice field. Tight end Dwayne Allen did not participate on Thursday as the Colts are evaluating the second-year tight end’s foot. The Colts welcomed over 7,000 fans into Macholtz Stadium on Tuesday night. That is the big news of Wednesday morning, along with a few doubters for Robert Mathis and the fan favorite that is Dwayne Allen. Take a look below at the top pieces from Wednesday, August 7th. Robert Mathis is used to receiving questions on being underrated. The response he usually gives to those questions is that he is “continuing to chop wood”. Now without Dwight Freeney opposite Mathis, the naysayers have risen again on whether or not No. 98 can keep up his recent sack numbers. “I’ve been hearing that since ’04 or ’05, maybe the first year I led the team in sacks. It’s been nonstop. In front of a 7,300 person crowd, the Colts offense put on a great show for fans on Tuesday evening. Andrew Luck was 26-of-35 and threw six touchdown with Reggie Wayne and T.Y. Hilton splitting the scoring grabs. Defensively, the highlight came when cornerback Cassius Vaughn intercepted Matt Hasselbeck to end the practice. He’s barely a year into his NFL career but Dwayne Allen is quickly becoming a fan favorite on and off the field for the Colts. Constantly in the community and producing on the field has Allen among the players autograph seekers scream to following the end of each practice. Colts offensive coordinator Pep Hamilton can see why that’s the case. Dwayne Allen got a few strange looks from teammates when he told them what was in store for his offseason. “A lot of the guys hear about it initially, they hear hot yoga, ‘Whoa too hot for me,’ and then they understand that it’s something that’s going to help their game and hopefully prolong it,” Allen says. 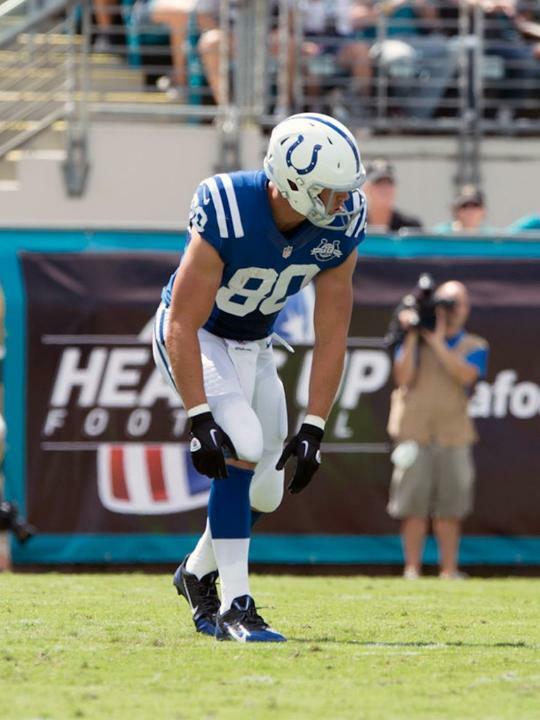 Allen entered the 2013 offseason fresh off setting Colts rookie tight end records in catches and receiving yards. The next progression for Allen was to improve his flexibility so the tight end got into contact with former Colts cornerback Marlin Jackson. “It was something that I was just researching and I came across (Jackson). He does a ton of yoga and also Justin Snow does yoga and recommended it to me,” Allen said. Colts tight ends coach Alfredo Roberts has taken notice of Allen’s offseason regiment and is pleased with the results. With the Colts heading into week two of the 2013 training camp, Allen looks very similar to the consistent, reliable target of last season. New Colts offensive coordinator Pep Hamilton is getting his first look at Allen, and the tight end friendly coach is enjoying watching No. 83 operate.